The North Gateway Plaza is a part of a larger initiative by the University of Toronto Mississauga Campus to establish a comprehensive public realm master plan for the pedestrian circulation of the Outer Circle Road. The creation of the Gateway is a result of the planning of the new Instructional Centre as a juxtaposed compliment to the Hazel McCallion Library. The Plaza space is created by removing the service road and defining the corridor width with benches, seating walls and tree planting. Two illuminated sections of low Eramosa limestone wall engraved with the University’s logo define the gateway threshold and provide opportunity for gathering. 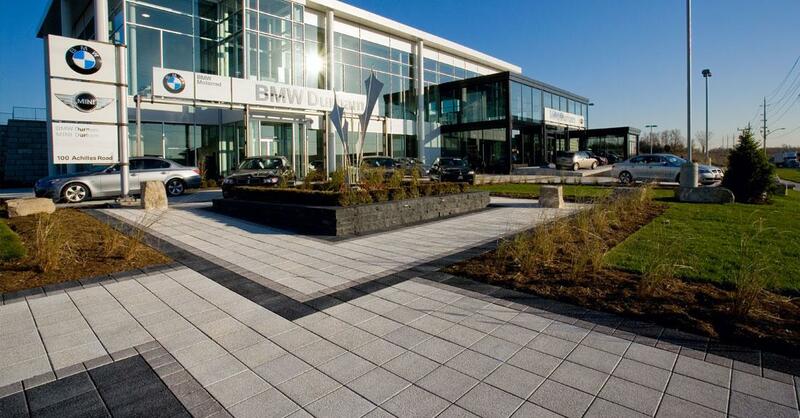 Strategically placed bosques of River Birch trees planted in permeable paving define the corridor and provide relief from the mid-day sun. Inspired by Christopher Alexander’s ‘A Pattern Language’, the primary paving pattern uses 300mm x 300mm Series 3000 Ice Grey, White and Black Granite, as a pixilated abstraction of the random movements of visitors and passersby. Carpets of solid black 300mm x 300mm Series 3000 Black Granite with a 400mm x 400mm border are used to identify principal entrances. By removing the barrier curbs and designing slopes at less than 4.5%, the plaza eliminates steps and railings and is completely accessible.